I'm a big fan of bachelor cooking - one pot, 375 degrees and 45 minutes cook time. My daughters will confirm this. Solar meets the "one pot" criterion which is most important for me. Usually I'll cook lunch at the office because I can put the cooker out at 10:30am and have lunch ready around noon. Generally it's a stew like rice & chicken. 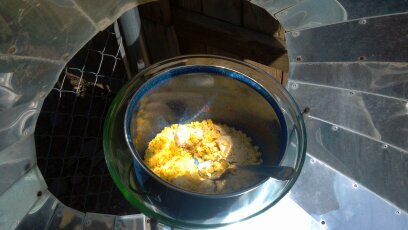 Here are some pics from a late afternoon meal of chicken & lentils. I started it at 4pm on a fall day. 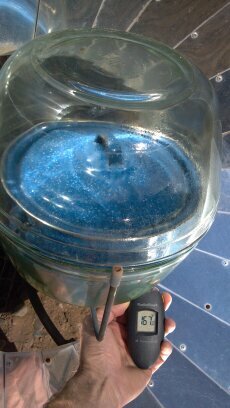 Within 30 minutes using a Zomeworks Solar Cooker the cooking pot was at 170 degrees F. Supper was 5:30pm. 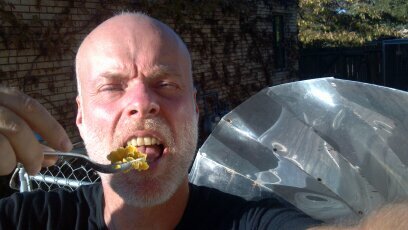 The Zomeworks cooker get food hot fast compared to the Burns Milwaukee Solar Oven because it's a parabolic dish. I like both cookers. I use the ZW at home because it's not very portable. The Burns Milwaukee is compact so I keep it at the office and put it in the corner between meals.